> Yesterday, when I got home from school, I saw a tweet regarding Corey Hart and how much he hates Spring Training, but I didn’t take it literally. So I tweeted a joke about how I’d be waiting to hear the news about more of his knee injuries come ST. But I wouldn’t have to wait very long. In fact, a few seconds later, I checked out the MLB news of the day- something I probably should have done first- and found that Hart will be out for 3-4 months with knee surgery. Yep, we can’t catch a break. This is the third straight ST in which Hart will have been injured for at least part of the time, and the second time over the past three years that he’ll miss at least the first month of the season. Anyway, this injury certainly affects how I view the possibility of the Brewers extending Hart. While he’s been a power-threat in the Brewers’ lineup ever since his break-out 2010, I don’t know how much longer the team can put up with his constant early season injuries. Also, if Hart misses more than just the first month of the season- which some speculate he will- it’ll hurt the sort of deal he gets, should he hit the free agent market at the end of 2013. 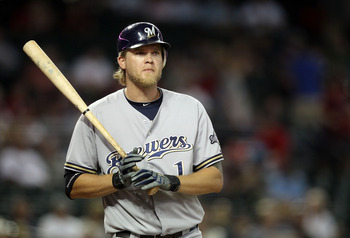 As for the Brewers, though, it would appear they’re going to give Mat Gamel yet another chance to start at first base. First base prospect Hunter Morris might get a closer look during ST, but it’s unlikely the Brewers would burn one of his options just so he could fill in for Hart for a month or so. Another internal option is Taylor Green, who, along with Gamel, was supposed to be fighting for a bench role going into ST.
Bottom line is, though, that this was a year Hart should have been a bit more careful. There’s evidently chronic issues with his knee that should have been fixed for good by now. > The Brewers’ list of World Baseball Classic players grew after the rosters for each country were announced on Thursday. 14 players were chosen: Ryan Braun (USA), Jonathan Lucroy (USA), Yovani Gallardo (Mexico), Marco Estrada (Mexico), Martin Maldonado (Puerto Rico), Hiram Burgos (Puerto Rico), Carlos Gomez (Dominican Republic), Jeff Bianchi (Italy), Hainley Statia (Netherlands), Mike Walker (Australia), John Axford (Canada), Jim Henderson (Canada), Green (Canada), and Rene Tosoni (Canada). All but three of the players- Statia, Walker, and Tosoni- are currently on the Brewers’ 40-man roster. > The club has also avoided arbitration with all of its eligibles. Gomez received $4.3 million, Axford $5 million, Estrada $1.955 million, and Burke Badenhop $1.55 million. All were one-year deals. The Brewers had already avoided arbitration with their other eligible, Chris Narveson, a few weeks back. > The Brewers signed catcher Robinson Diaz to a minor league deal. > Former Milwaukee Braves shortstop Johnny Logan is going to be inducted into the Brewers’ Walk of Fame. > Today was an extremely sad day for baseball: former Orioles manager Earl Weaver and Cardinals legend Stan Musial both passed away. Weaver was 82 while Musial was 92. Padres: Re-signed Will Venable, Joe Thatcher, and Everth Cabrera to one-year deals; signed Brad Hawpe and Lucas May to minor league deals. Red Sox: Signed Mike Napoli to a one-year deal; re-signed Jarrod Saltalamacchia, Joel Hanrahan, and Jacoby Ellsbury to one-year deals; re-signed Craig Breslow to a two-year deal. Rangers: Signed Matt Harrison to a five-year extension; re-signed Neftali Feliz to a one-year deal. Twins: Re-signed Drew Butera to a one-year deal. Pirates: Designated Zach Stewart for assignment; re-signed Garrett Jones to a one-year deal. Diamondbacks: Re-signed Tony Sipp and Ian Kennedy to one-year deals. Astros: Signed Rick Ankiel to a one-year deal. Mets: Re-signed Bobby Parnell and Ike Davis to one-year deals; signed Landon Powell to a minor league deal. Reds: Re-signed Logan Ondrusek to a two-year deal. Nationals: Re-signed Drew Storen and Craig Stammen to one-year deals. Yankees: Re-signed Joba Chamberlain to a one-year deal; signed Bobby Wilson and Reegie Corona to minor league deals. Athletics: Re-signed John Jaso and Seth Smith to one-year deals. Angels: Re-signed Alberto Callaspo to a two-year deal; re-signed Jason Vargas to a one-year deal. Cubs: Re-signed Matt Garza to a one-year deal. Giants: Re-signed Jose Mijares, Hunter Pence, and Buster Posey to one-year deals. Indians: Re-signed Drew Stubbs and Chris Perez to one-year deals; signed Ryan Raburn to a minor league deal. Orioles: Re-signed Matt Wieters to a one-year deal. Blue Jays: Re-signed Josh Thole to a two-year deal. Tigers: Re-signed Rick Porcello to a one-year deal. White Sox: Signed Tony Pena Jr. to a minor league deal; signed Matt Lindstrom to a one-year deal. Marlins: Singed Matt Downs to a minor league deal.